DIE Veneris, 9 die Junii. E. Bedford and E. Portland, concerning Whittlesea. Colonel Ashton, to restore Serjeant Whitfield's Horses. Covenant taken by the Lords. Covenant to be taken by the Kingdom. Declaration of Loyalty to the King. Committee to draw it up. Message to the H. C. that the Lords agree to the Covenants, and the Resolutions made on the Discovery of the Plot. Covenant to be tendered to the absent Lords when they come. The Covenant to be taken by the whole Kingdom. Ordered, That a Servant of the Lady Cheeke, Ric'd Battie, shall have a Pass, to go to Oxon, and from thence to Sarum, and back to London. Ordered, That the Cause concerning the Earls of Bedford and Portland, concerning Wittlesea, shall be heard To-morrow Morning, at this Bar; but, in Case the Cause cannot be heard, then the Witnesses are to be sworn, and their Informations taken by a Master of the Chancery. Ordered, That the Lady Watson and her Children shall have a Pass, to come out of North'tonshire, to London. Ordered, That the Person that is appointed by this House, to officiate the Cure of Stanford Rivers, shall have the whole Profits allowed him for his Pains. Ordered, That Colonel Hurry shall have a Pass, to go to the Lord General. Ordered, That Lieutenant Colonel Ashton shall immediately, upon Sight hereof, (fn. 1) deliver and restore to Mr. Serjeant Whitfeild, or whom he shall appoint, his Horses taken away. Ordered, That Mr. Auditor Povey shall have the Protection of this House, for the securing his Goods and Horses at Hounsloe, he keeping One of them for a Light Horse; and shall have Liberty to pass and re-pass from London to Hounsloc. Next, the Covenant was tendered to the Peers; and it was unanimously and solemnly taken by all the Lords now present, in these Words following; and the Youngest Baron began, and so it went upward according to their Degrees, their Lordships holding the Paper in their Hands, and every one reading of it distinctly. "1 A. B. in Humility and Reverence to the Divine Majesty, declare my hearty Sorrow for my own Sins, and the Sins of this Nation, which have deserved the Judgements and Calamities that now lie upon it; and my true Intention is, by God's Grace, to endeavour the Amendment of my own Ways. And I do further, in the Presence of Almighty God, Declare, Vow, and Covenant, That, in order to the Security and Preservation of the true, Reformed Protestant Religion, and Liberty of the Subject, I will not consent to the laying down of Arms, so long as the Papists now in open War against the Parliament shall, by Force of Arms, be protected from the Justice thereof; and that I do abhor and detest the said wicked and treacherous Design lately discovered; and that I never gave, nor will give, my Consent to the Execution thereof; but will, according to my Power and Vocation, oppose and resist the same, and all other of the like Nature; and, in Case any other like Design shall hereafter come to my Knowledge, I will make such timely Discovery as I shall conceive may best conduce to the preventing thereof: And whereas I do believe, in my Conscience, that the Forces raised by the Two Houses of Parliament are raised and continued for their just Defence, and for the Defence of the true Protestant Religion, and Liberties of the Subject, against the Forces raised by the King, that I will, according to my Power and Vocation, assist the Forces raised and continued by both Houses of Parliament, against the Forces raised by the King without their Consent; and I will likewise assist all other Persons that shall take this Oath, in what they shall do in Pursuance thereof; and will not, directly or indirectly, adhere unto, nor shall willingly assist, the Forces raised by the King without the Consent of both Houses of Parliament: And this Vow and Covenant I make, in the Presence of Almighty God, the Searcher of all Hearts, with a true Intention to perform the same, as I shall answer at the Great Day, when the Secrets of all Hearts shall be disclosed." Edward Lord Howard of Est. William Lord Viscount Say & Seale. Phillip Earl of Pembrooke and Mountgomery. Edward Earl of Manchester, Speaker of this House, pro Tempore. Agreed to, with a small Alteration. It was moved, "A short Declaration might be drawn up, and taken by their Lordships, the House of Commons, and the whole Kingdom, to declare their Loyalty to the King's Person, and His Crown and Dignity." Any Three, to meet this Afternoon, at Two a Clock. Ordered, That the Day of Thanksgiving shall be on Thursday next. 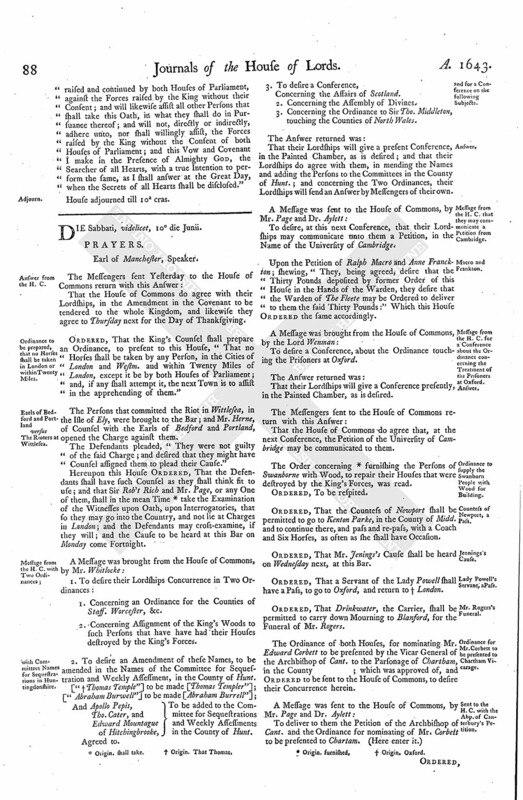 To let them know, that all the Lords have taken the Covenant; and that their Lordships do agree to the Covenant to be offered to the whole Kingdom, with some small Alterations; and that their Lordships do agree to the Votes brought from the House of Commons, concerning the Resolutions upon the Discovery of the Plot; and that their Lordships have appointed Thursday next for the Celebration of the Day of Thanksgiving, and have appointed the Abby Church in Westm. for the Lords, and Mr. Calamy and Mr. Herle to preach. Ordered, That the Speaker of this House shall offer the Covenant to those Lords that were absent this Day, when they come to the House. 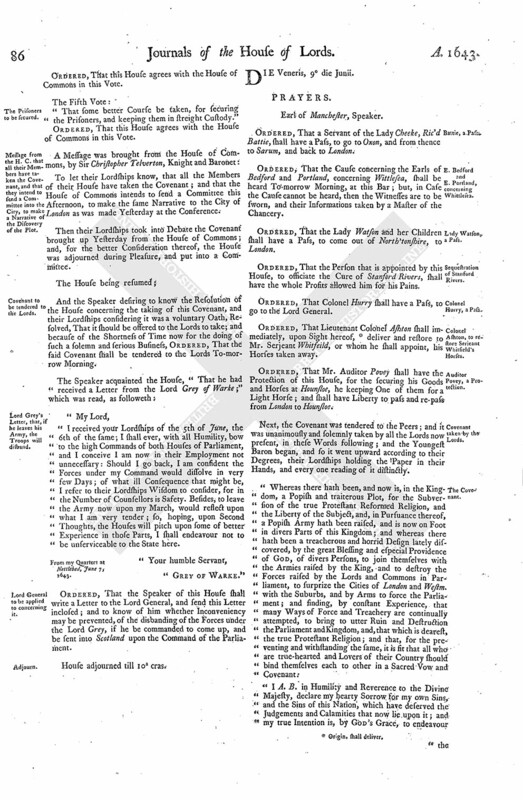 "Whereas the Lords and Commons now assembled in Parliament have Declared, That there have been, and now is, a Popish and traiterous Plot, for the Subversion of the true Protestant Reformed Religion, and the Liberty of the Subject; and that, in Pursuance thereof, a Popish Army hath been raised, and is now on Foot in divers Parts of this Kingdom; and have further, in a solemn Manner, Declared, Vowed, and Covenanted, (fn. 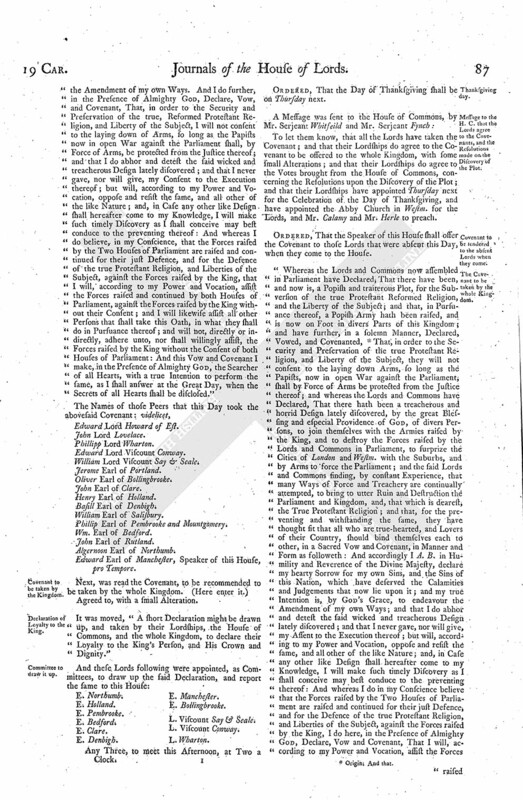 2) That, in order to the Security and Preservation of the true Protestant Religion, and Liberty of the Subject, they will not consent to the laying down Arms, so long as the Papists, now in open War against the Parliament, shall by Force of Arms be protected from the Justice thereof; and whereas the Lords and Commons have Declared, That there hath been a treacherous and horrid Design lately discovered, by the great Blessing and especial Providence of God, of divers Persons, to join themselves with the Armies raised by the King, and to destroy the Forces raised by the Lords and Commons in Parliament, to surprize the Cities of London and Westm. with the Suburbs, and by Arms to force the Parliament; and the said Lords and Commons finding, by constant Experience, that many Ways of Force and Treachery are continually attempted, to bring to utter Ruin and Destruction the Parliament and Kingdom, and, that which is dearest, the True Protestant Religion; and that, for the preventing and withstanding the same, they have thought fit that all who are true-hearted, and Lovers of their Country, should bind themselves each to other, in a Sacred Vow and Covenant, in Manner and Form as followeth: And accordingly I A. B. in Humility and Reverence of the Divine Majesty, declare my hearty Sorrow for my own Sins, and the Sins of this Nation, which have deserved the Calamities and Judgements that now lie upon it; and my true Intention is, by God's Grace, to endeavour the Amendment of my own Ways; and that I do abhor and detest the said wicked and treacherous Design lately discovered; and that I never gave, nor will give, my Assent to the Execution thereof; but will, according to my Power and Vocation, oppose and resist the same, and all other of the like Nature; and, in Case any other like Design shall hereafter come to my Knowledge, I will make such timely Discovery as I shall conceive may best conduce to the preventing thereof: And whereas I do in my Conscience believe that the Forces raised by the Two Houses of Parliament are raised and continued for their just Defence, and for the Defence of the true Protestant Religion, and Liberties of the Subject, against the Forces raised by the King, I do here, in the Presence of Almighty God, Declare, Vow and Covenant, That I will, according to my Power and Vocation, assist the Forces raised and continued by both Houses of Parliament, against the Forces raised by the King without their Consent; and will likewise assist all other Persons that shall take this Oath, in what they shall do in Pursuance thereof; and will not, directly or indirectly, adhere unto, nor shall willingly assist, the Forces raised by the King without the Consent of both Houses of Parliament; and this Vow and Covenant I make in the Presence of Almighty God, the Searcher of all Hearts, with a true Intention to perform the same, as I shall answer at the Great Day, when the Secrets of all Hearts shall be disclosed."